The items in the table below can be customized. Be sure to make a note of the current setting before customizing. (d) Enter the following menus: Body Electrical / Smart Key / Utility / Customize Setting. (a) Check that the power source mode is OFF and the LED on the key is not blinking. Press the LOCK button and one of the other buttons on the key at the same time for approximately 5 seconds while the key is in the actuation area. When the switches are pressed and held for 5 seconds, the entry door unlock mode changes to the mode that is not currently selected. After pressing and holding the switches for 5 seconds, wait 5 seconds before performing the same procedure again. When the driver door touch sensor is touched, only the driver door unlocks. When another touch sensor is touched, all doors unlock. When any touch sensor is touched, all doors unlock. (b) The certification ECU (smart key ECU assembly) receives this signal from the door control receiver assembly and changes the smart key system to the entry unlock mode. 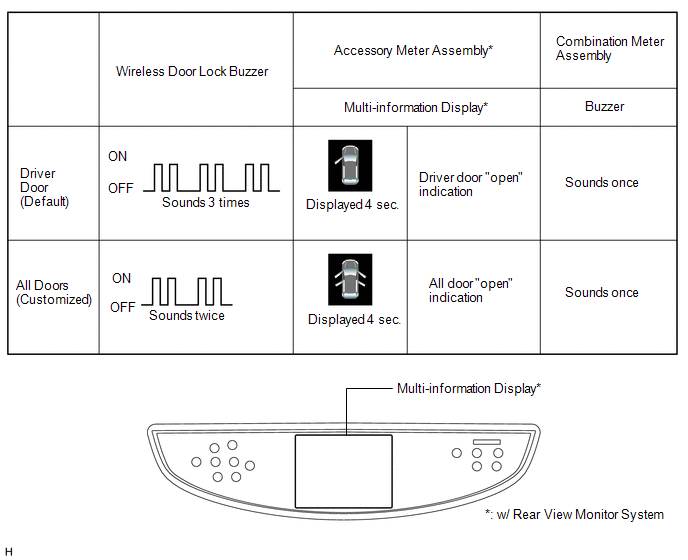 (c) The certification ECU (smart key ECU assembly) sounds the buzzers of the wireless door lock buzzer and combination meter to inform the user that the mode has been changed. The procedure only changes the entry unlock mode of the smart key system. It does not switch the unlocking of the wireless door lock control. Engine switch off, driver side door closed and unlocked. (1) Push the unlock switch of the key once. (2) Open the driver door within 5 seconds. (3) Push the unlock switch of the key twice within 5 seconds. (4) Close and open the driver door twice within 30 seconds. (5) Push the unlock switch of the key twice within 5 seconds. (6) Close and open the driver door within 30 seconds. (7) Close the driver door within 5 seconds. When electrical key cancel is activated, the wireless door lock buzzer sounds twice. To return to the original condition, perform the procedures again. When the original condition is returned, the wireless door lock buzzer sounds once.